Fortunately for the safety of motorcycle riders across the nation, many states have laws in place to avoid serious injury and even death – by wearing helmets. 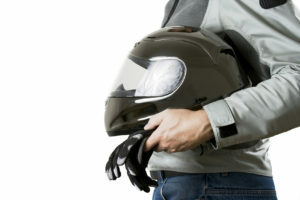 Many states have taken initiative to pass laws that require motorcycle riders to wear helmets. These laws go hand-in-hand with whether or not you will be able to recover damages if you are injured in a motorcycle accident, because wearing a helmet and the nature of your injuries can be determining factors in your case. According to the National Highway Traffic Safety Administration, for every 100 motorcyclists killed in a crash while not wearing a helmet, 37, would have survived if they would have been. This is why many states have decided that it is extremely important to pass laws requiring riders to wear helmets whether they are over a certain age or not. It depends on your state and what they have decided. Currently, 19 states and the District of Columbia have motorcycle helmet laws. 28 states have laws requiring only some to wear a helmet, and only three have no laws at all. In the past, there has been pressure from the federal government to create these laws and ensure that riders will be safe. By the 1970s, many motorcycle helmet laws were being instilled for the first time and lives were being saved. In California, it is law that all riders wear motorcycle helmets, no matter the age. This motorcycle helmet law also covers all low-power cycles. This means that California is one of the nineteen states to have enlisted in a program where all motorcycle riders, no matter the age, must wear a helmet to protect themselves on the roadways. Wearing Helmet But no Head or Neck Injury: In this case, the helmet may be irrelevant to your injury claim. However, you should always prove that you are a responsible rider by mentioning the fact of the helmet anyway. Not Wearing Helmet, But no Head or Neck Injury: In this situation, it is also irrelevant to mention the helmet. Wearing Helmet With Head or Neck Injury: In this case, the helmet will be important to your claim. It will show the court that your injuries were not worsened due to your own carelessness. It will also show that your injuries could have been worse but you prevented that by wearing a helmet. Not Wearing Helmet, No State Helmet Law, With Head and Neck Injury: It may be hard to recover in this case. They may find “comparative negligence,” which means that you could be found partially responsible for your injuries. You must be able to persuade many involved with the suit that you would have sustained injuries regardless of the helmet. Not Wearing Helmet, State Helmet Law, With Head or Neck Injury: This will be the most difficult scenario if you wish to receive damages. Comparative negligence will automatically be established. You will need the help of a personal injury attorney for this. Luckily, we have your back if you have been injured in a motorcycle accident. We understand the California helmet laws to a higher extent and can help you receive the damages you deserve after an accident. Call us today for a consultation to speak to an attorney.